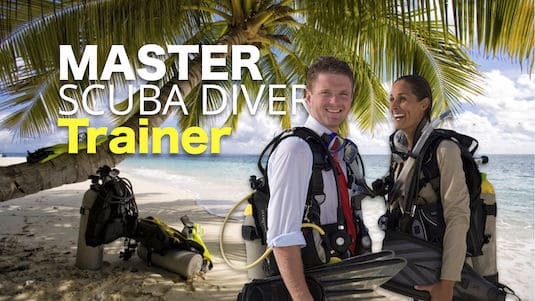 In order to train someone to become a Master Scuba Diver, an Instructor must be able to teach at least 5 PADI Specialties. The quickest way to become a Specialty Instructor is to complete the Specialty Instructor course with your Course Director. Immediately following the IE, you’ll have the opportunity to train in any number of Specialties offered by Mike. With his years of experience training professional divers, Mike is qualified to teach a broad range of Specialties. Many of these are fairly uncommon. Therefore with Mike you receive the unique opportunity to set yourself apart from the rest. The MSDT Preparation is a 2-3 day programme including 5 Specialties. You are welcome to choose to become an Instructor in more than 5 Specialties if you wish. Upon completion of your training you’ll be welcome to intern at Aqua-Marina gaining experience team-teaching PADI courses alongside our experienced instructional staff; earning certifications as you go.